Looks tell a thousand things about a person’s personality. A good hair cut can thus build personal confidence since it is something that other individuals get to appreciate. To get the best summer or spring haircut, you need an expert barber. However, the expertise of a barber can at times fail thus bringing a lot of disappointment on your part. To this end, you ought to consider another aspect that is often left unnoticed. The choice of shaving tools is paramount to the perfect haircut. Donald Scott NYC tools have been known to yield the best results when it comes to hair trimming. Some of the products in production today include the DS/X4 Razor and naked blades, Groom Stik Pro Trimmer, Carving Comb fine and wide, Chop stik pro razor, and the swivel twist razor. For smooth haircuts, Donald Scott uses the prepare liquid tool glide that acts as a lubricant coupled with naked razor blades. The DS/X4 Razor is a diamond cut high-end blade. The module’s design comes in such a way that it allows you or the barber to get rid of hair from tight spots and corners with high precision. Besides, it is very light and comfortable to hold thus allowing you to get a quality cut at the end of the day. Also, the blade is good at removing big hair. Cuts are typically close and clean, and the sharp razors help reduce chances of hair damage. The groom stik pro, on the other hand, is used to add attention to detail after every haircut. For instance, it is a component used to enhance your hairline, so as to give you that elegant look. The groom stik accesses hair that is close to very sensitive places like the ears. There is another category of people who love getting style haircuts. It is in such a moment that the groom stick pro trimmer comes in handy. Another advantage that comes with the groom stik is that it cuts hair in only one stroke this yielding a single line with every move. Moreover, this product has an adjustable blade guard that helps one achieve different results when it comes to a haircut. It can be used to cut hair from the face, neckline and other parts of the body. On the other hand, the carving comb helps reduce layers towards the tips of a hair strand. For this reason, this tool helps create a variation in a hair look. The swivel twist razor is a tool ideal for male haircuts. It is used to blend, remove and create texture, especially for little hair shaves. The swivel twist razor blade is a tool of choice for many barbers since it has a handheld flexibility of three hundred and sixty degrees, and thus causes less wrist tension to the individual using it. Also, it helps get rid of scissor marks thus contributing to the achievement of a much-blended look. The chop stik pro razor is a component used to remove excess hair and create tapering hair ends. It is a tool that produces surfaces conditioned for weaving. 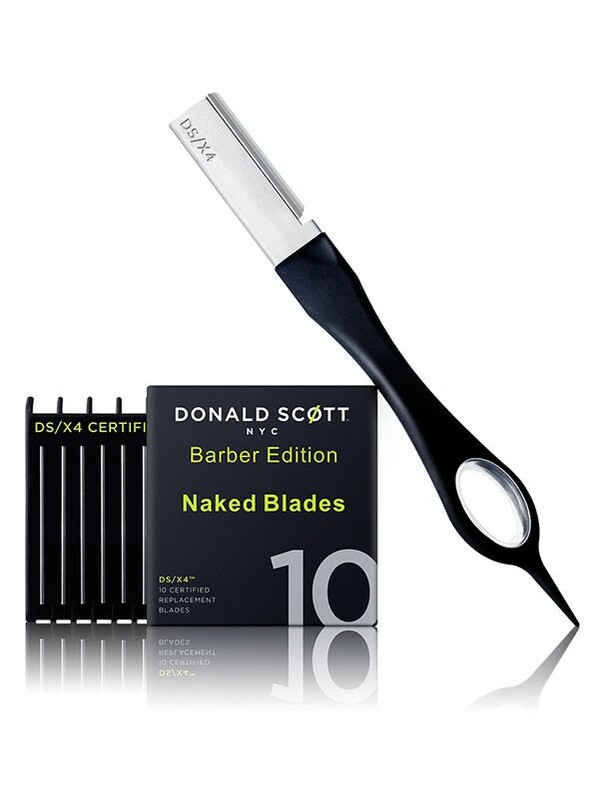 Donald Scott NYC presents precision razor hair cutting tools that can achieve longer or shorter hair styles. Also, Donald Scott’s tools are ideal for both men and women. With these tools, one can realize greater detail when it comes to a decent hair look. For these devices to work well, they ought to be used hand in hand with the prepare liquid tool glide. By using these tools, one has the guarantee of a great look that may last for many days to come.